"Pollinators, particularly bees, play a vital role in supporting ecosystems in agricultural, urban and natural landscapes," said Christina Grozinger, distinguished professor of entomology and director of the Center for Pollinator Research in Penn State's College of Agricultural Sciences. "Nearly 90 percent of flowering plant species use pollinators to set seed and fruit, which animals—including humans—rely on for food." Yet Pennsylvania beekeepers lose nearly 50 percent of their honey bee colonies each winter, Grozinger added, and several wild bee species—including the bumble bee Bombus pensylvanicus—are threatened or endangered. These trends are occurring across the United States and around the world. "We know that bee populations are declining because of several key stressors, including exposure to insecticides, reduced abundance and diversity of the flowering plants that bees depend on for their food, and loss of nesting habitat for wild bees," she said. Grozinger noted that bees travel large distances—several kilometers from their hives in the case of honey bees—to find food for their babies. But it has been nearly impossible for a beekeeper, or anyone interested in understanding what the bees in their backyards or farms are experiencing, to know what stressors their bees might encounter during their trips. Beescape.org allows users to select a specific location—the apiary where they house their honey bee colonies, their home garden or their farm, for example—and obtain these landscape-quality scores for the surrounding region, up to 5 kilometers away. Users also can examine the crops that are being grown in the areas around them. "Beescape allows people to see the world as a bee, which will help them make decisions about where to place their colonies or steps they and their neighbors can take, such as planting pollinator gardens or reducing insecticide use, to make the landscape more friendly for bees," said project collaborator Maggie Douglas, an assistant professor at Dickinson College in Carlisle. 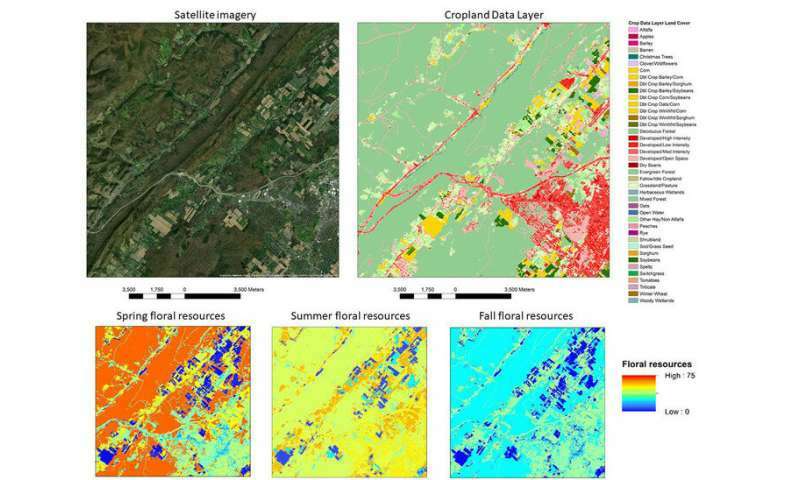 "With data provided by beekeepers from agricultural, rural and urban landscapes across multiple states, we will be able to develop high-quality predictive models that will be included in the website in the future," said Melanie Kammerer Allen, graduate student in ecology at Penn State, who is involved in the project. "This will allow beekeepers to determine if they should provide the bees with supplementary food, for example, or for a grower to decide if they should add pollinator nesting habitat near their crops."